An old Danish trundle bed, imported by Danish Country Antique Furniture in Boston. 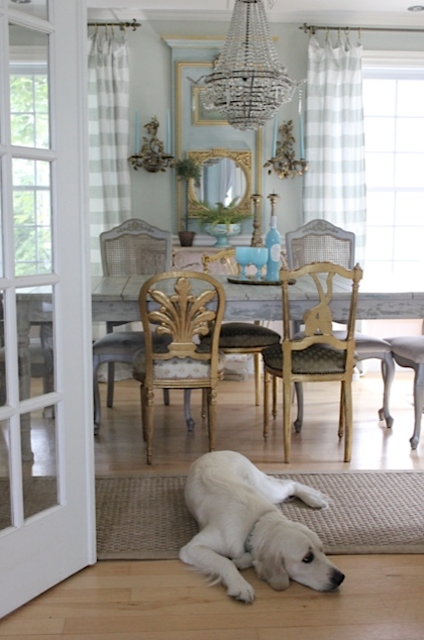 out around here when it comes to old things like furniture and decorative accessories. through the furnishings aisle and this white painted wooden country sofa was sitting there amidst a bunch of 1970s cast offs. I stopped. I brushed the arm of the sofa and looked at the back. Then the legs...and then I snapped a picture and went home. Without it. 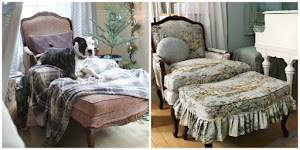 I didn't think hubs would be in favor of a less comfortable sofa, even if it was antique, and maybe from his homeland, Sweden and even if it was really cute. So I shared the photo with a bestie, who texted me back, " Go get it!". On the way there I worried maybe it was gone, off to its forever home with the wrong person. I called the Salvation Army to inquire if an old white sofa with blue and white stripes was still sitting there? Yes it was I was told. Could I put a hold on it? No, I could not, I was told. in this old country piece like I could. When I got there, she was waiting for me. For me! I gave her a good look over. She was an old girl for sure. that no one would be allowed to help me load it, as they were worried about liability. What?? I had a little furniture shop, and I loaded furniture into peoples cars all the time. until I saw some other shoppers I could ask to help me put it in my truck. Fine, the manager said, all business like...and thats when he called two guys to bring it out to the parking lot and put it next to my truck. Not to load it. And that is when I realized how damn heavy the thing was. OMG it weighted a ton! showing where it came from: Danish Country Antique Furniture, in Boston. The guys brought it outside and without further adieu they hoisted it up into the bed of the truck. Chivalry and common sense was not dead after all! It sat in the pickup truck til hubs and one of my sons got home to carry it inside. with how the room looks now. My old painted tea table seemed to be the perfect companion for it. Copenhagen. It was a trundle bed made around 1860, painted white. imagine a piece like this in a breakfast room or on a screen porch overlooking the lake. 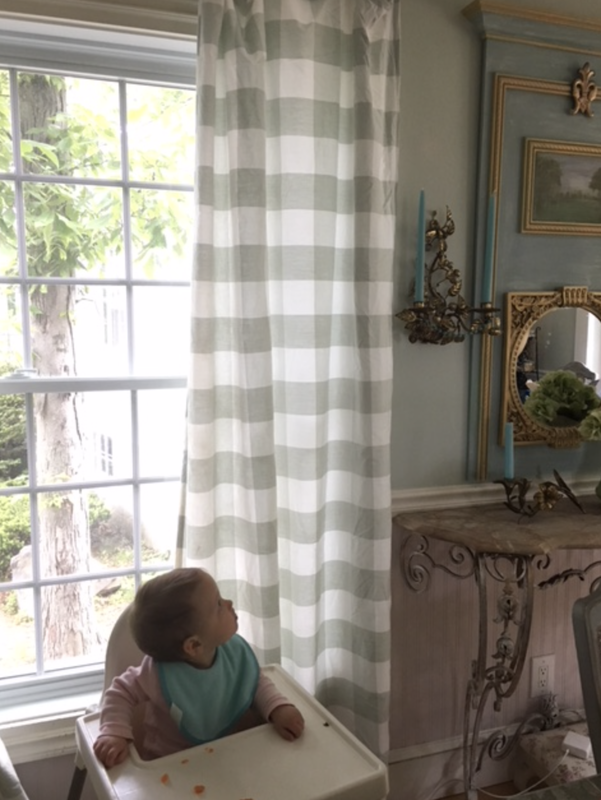 One more thing...today is my granddaughter Reeve's first birthday. To mark the occasion she took her first swimming lesson with mommy and daddy. 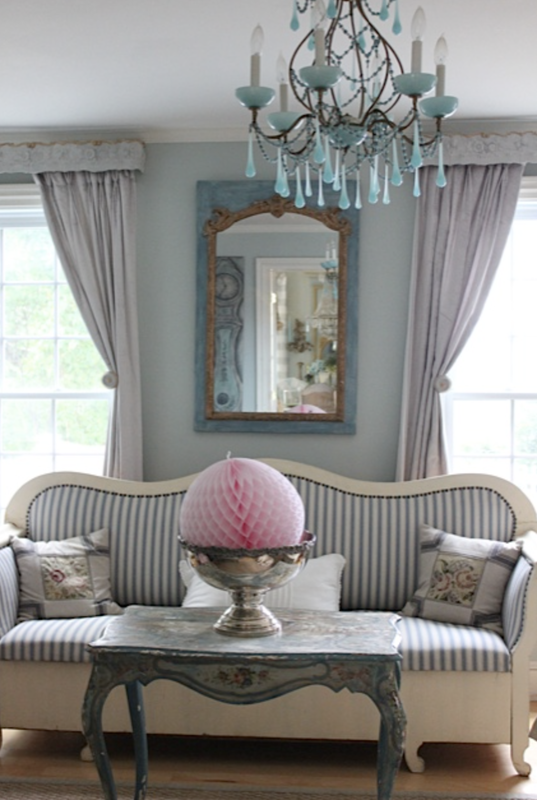 I put a big pink tissue ball in the silver punch bowl. One day I can see little Reeve sleeping in the trundle at the lake house. in this charming and cozy trundle bed over the last 150 years. can tell, if you know how to look and find them. The ultimate in French mirrors, is the Trumeau mirror. 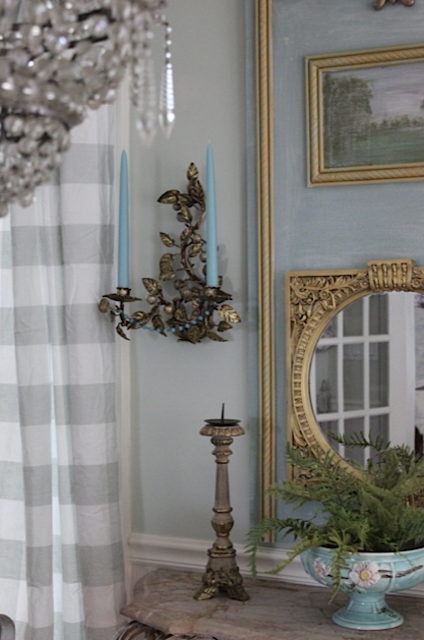 Trumeaus were made in France in the late 1800s, and were made to go on walls between windows. 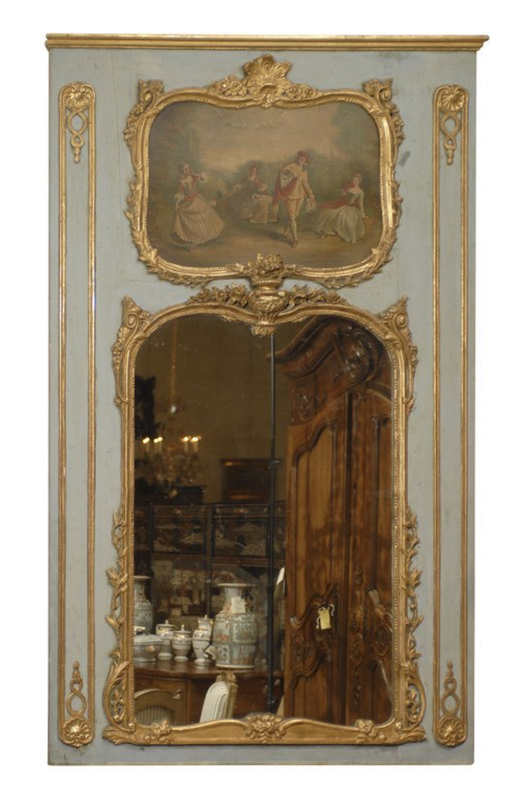 A rectangular mirror with two sections, the lower with a mirror and the upper had a decorative carving or a decorative painted scene that was the focal point of the mirror. 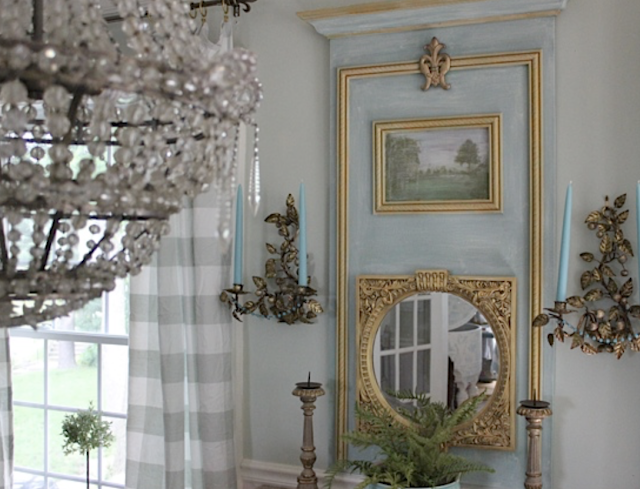 I have long admired these mirrors, but authentic French Trumeaus are very pricey. sold on First Dibs at just under a very pricey $15,000. 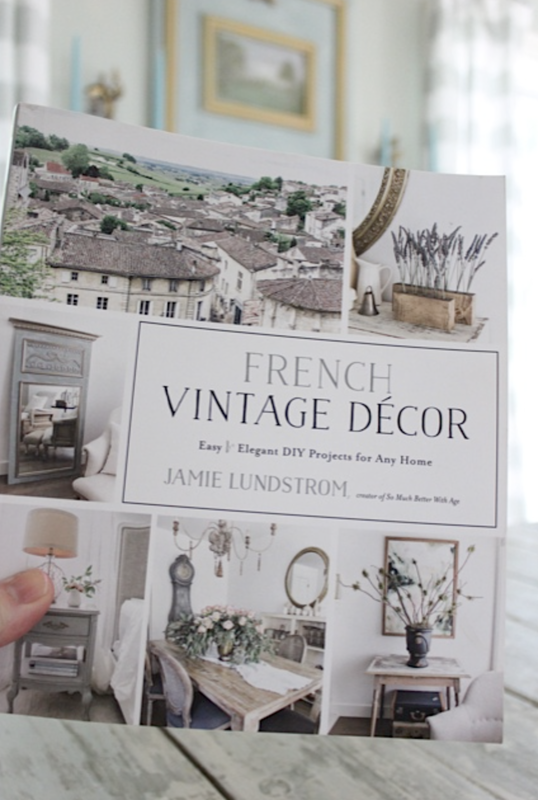 a DIY book about all things Vintage French style. And inside Jamie's book, was a how-to for making a French Trumeau mirror! It is among 70 projects for adding Vintage French decor to your home. It was time for a change in the dining room, I had even been contemplating wallpaper. After taking everything off the walls, we headed to Home Depot to get supplies. 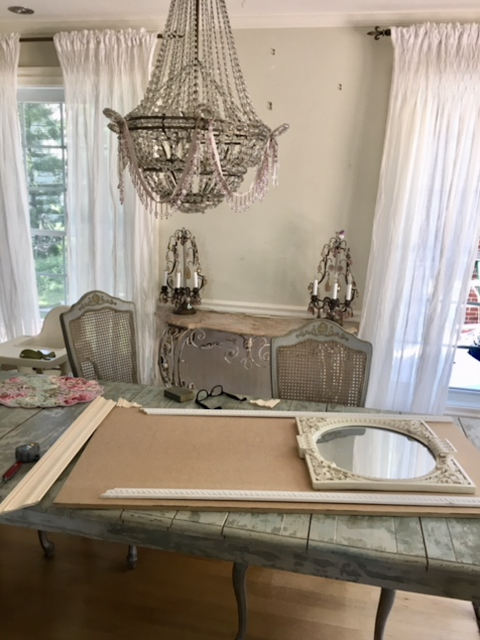 but I figured by using a framed mirror I already had, it would be less expensive and easier! The point is you can do it either way and end up with the mirror of your dreams. as many of the original Trumeaus were made this way. Note the lack of moldings on the bottom, and the simple molding on the top. The focus is on the mirror and the decorative carving. own mirror, and that is really the fun part! 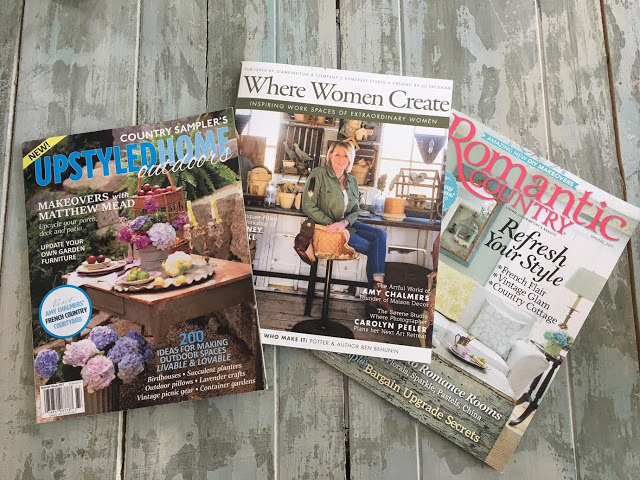 The colors and styles are endless, which makes it perfect for personalizing your home. 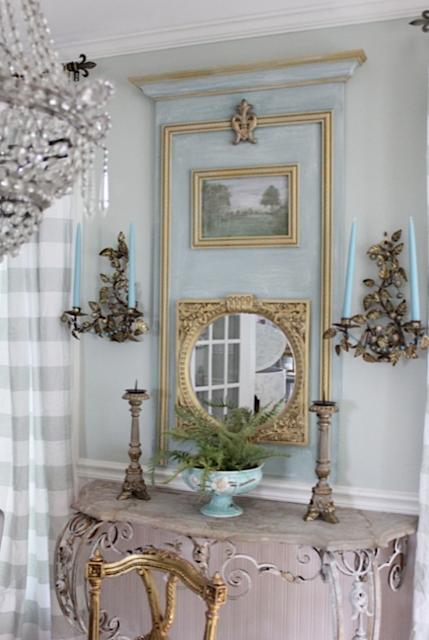 You could add French wallpaper or fabric instead of a painted scene for your focal point. 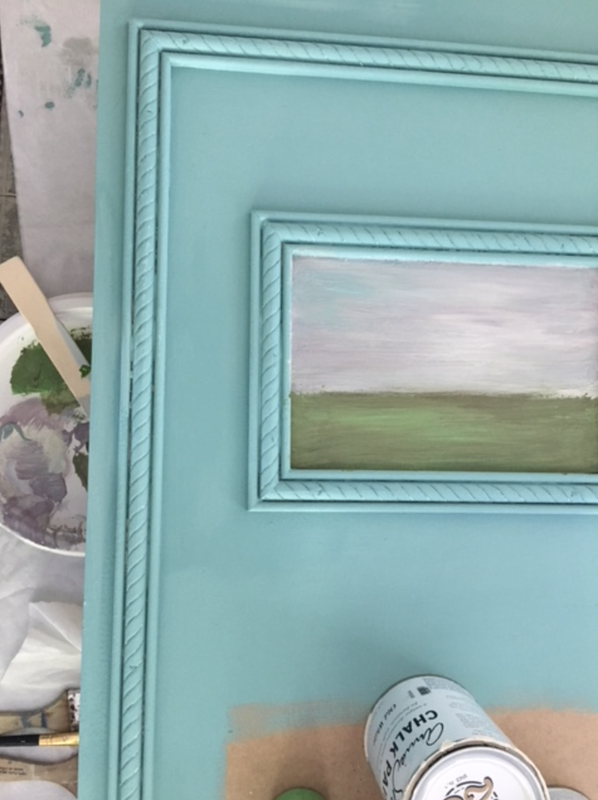 and I got out all of my Annie Sloan paints. I was hoping for a grey, but there was none to be had. So I decided to do a turquoise color and then soften it up with some aging techniques. of lavender color to the sky scene so it would pull in my purple transfer ware dish collection. Matthew Mead's Metallic Gold paint by Fusion. The gold was making it look so French and amazing! At this point I was getting very excited! 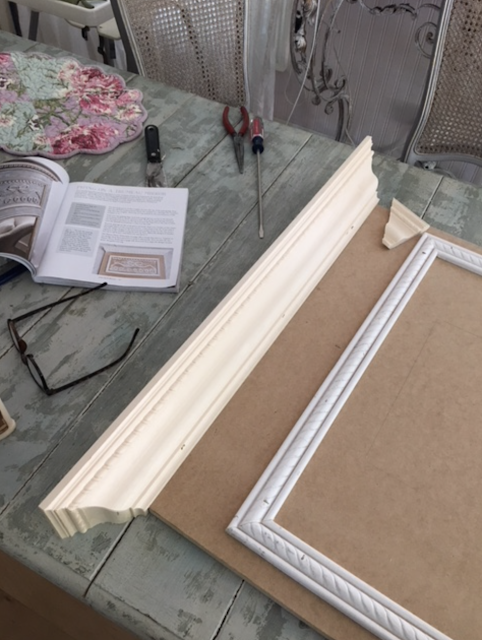 using construction grade glue I applied with a caulking gun. All of these instructions are outlined in Jamie's book. I created my own version using the bones of her instructions. and realized I should probably change the entire room! GAH! Paint the walls and change the curtains!! the mirror and it seemed when she awoke she noticed the changes!! Look at her cute face during lunch time staring at the mirror!! hahah! She is my little unwitting decorating apprentice. 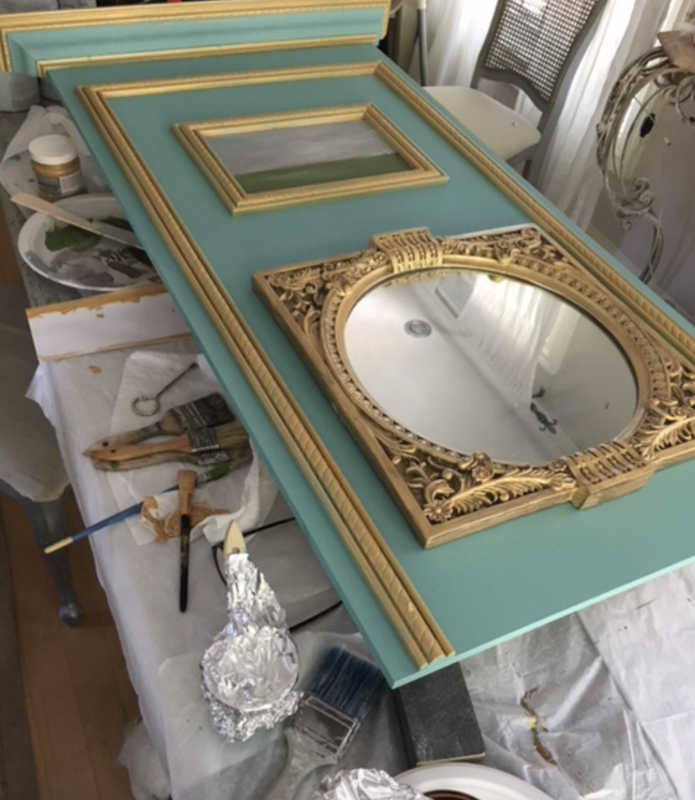 Without further adieu, I show you the completed mirror! 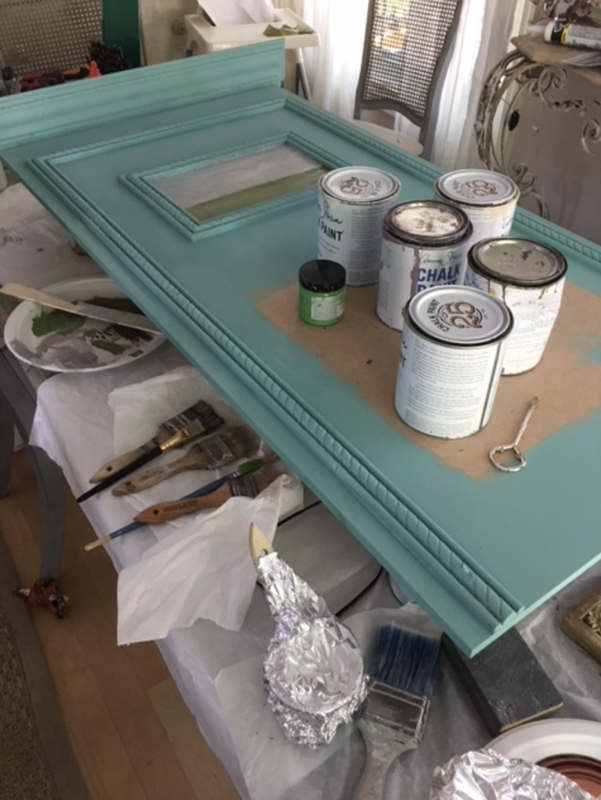 Layers of white, olive and pale green paint were dry brushed over the turquoise base color. 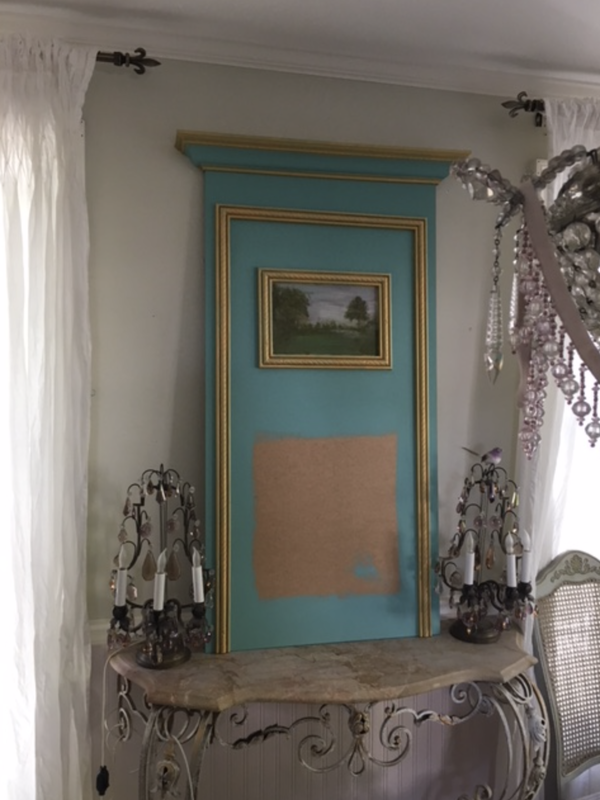 with the little painted scene and the drapery part finished it off. macaroni beads and some aquamarine Creative Candle tapers. 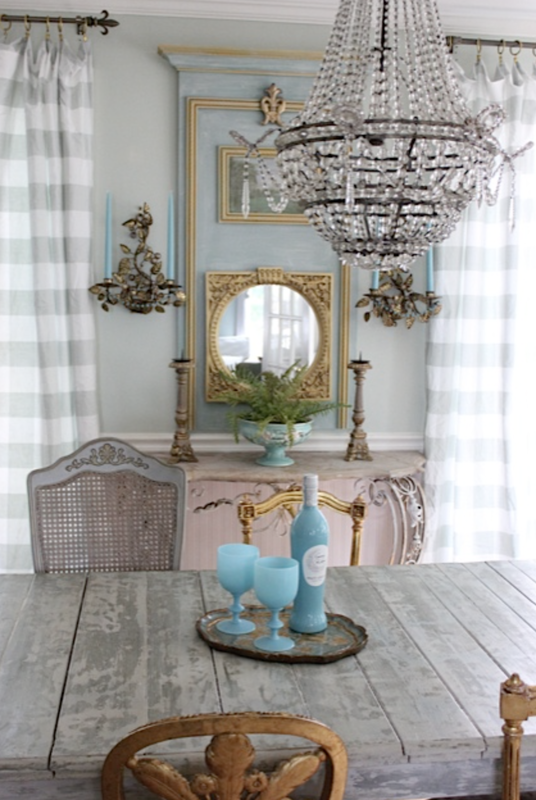 with the French Vintage style I adore. The pale green buffalo plaid curtains give it the Gustavian look I LOVE. 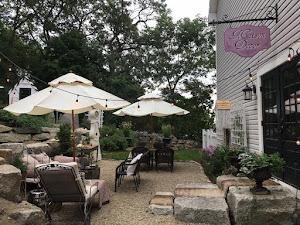 Gemma di Luna Pinot Grigio. It is about $15, and just the bottle is worth that all day long! noticed how perfectly they complemented the gold in the mirror. fulfilling day projects I have done in a long time!! Yes, it only took me one day!! 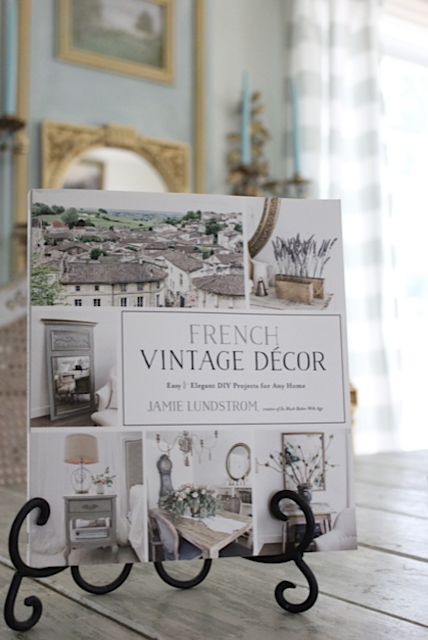 of Jamie's French Vintage Decor book. there are simple to medium skill level projects included in this book. due out June 12, 2018! Happy decorating peeps!! Monet's Water Lilies, painted in 1907, was just a fingertip away yesterday when I found myself chaperoning my son's high school class to Boston's Museum of Fine Arts. 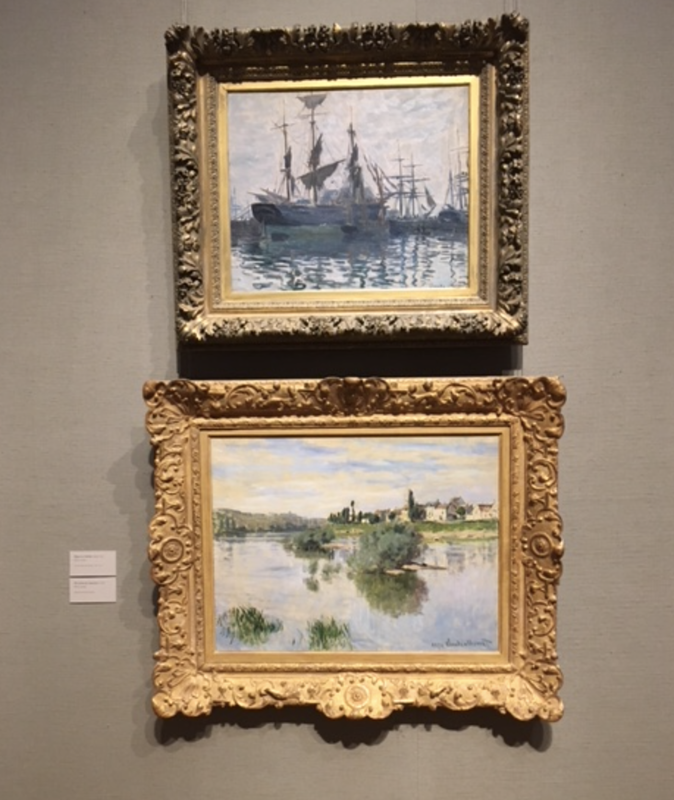 There was an entire room filled with Monet's paintings, and I think this was my favorite. We were told not to touch any of the artwork, and of course we didn't, but it felt so surreal to have this masterpiece right in front of my face without anyone watching. It was a private moment, and quite luxurious for my soul. 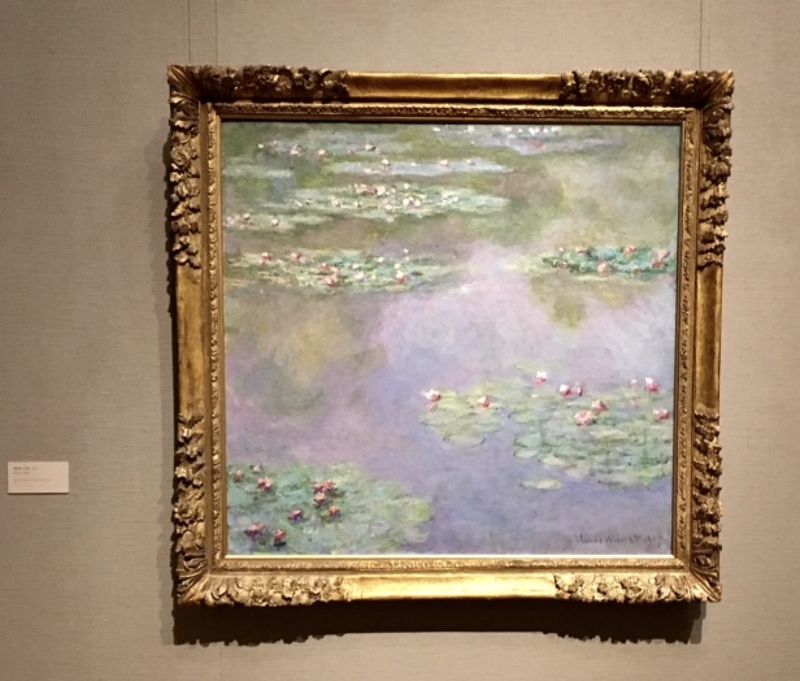 Monet's purple, green and pink paint colors were luminous, and breathtaking. I was very interested in how he painted his landscapes, as I relate to this stye of painting. Monet painted many other things besides his famous water lilies and Giverny gardens, including this "Ships in a Harbor" painted in 1873. 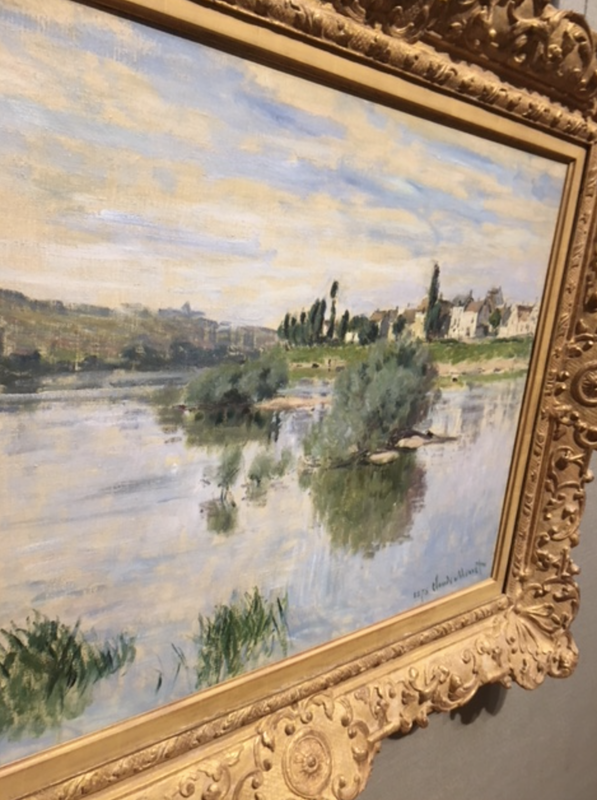 The scene below is "The Seine at Lavacourt" painted in 1878. 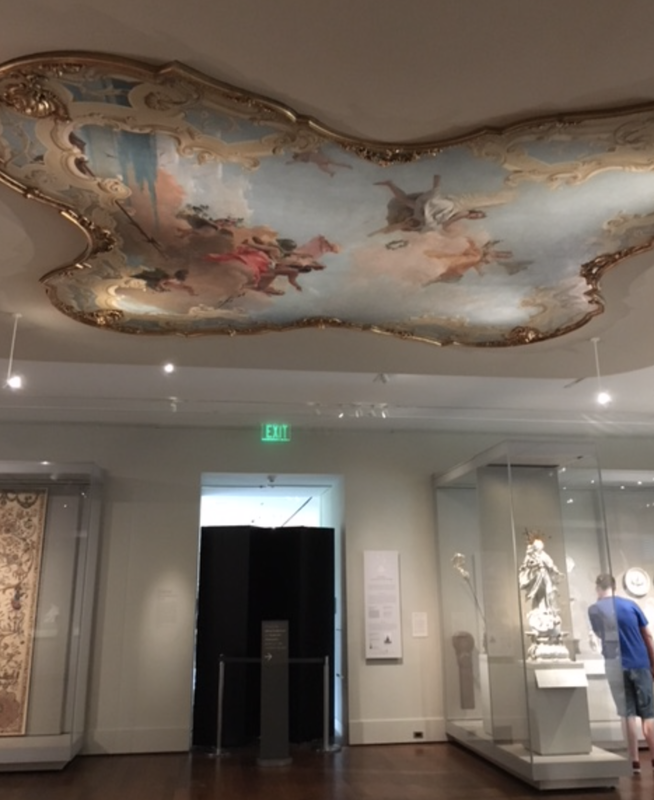 My eye was drawn to the French style at the MFA, including this ceiling treatment. An unexpected addition to this gallery, it was most impressive and beautiful. All in all, a very nice outing and one I should plan to attend on an annual basis. As a college student in Boston, I studied art, and some of our classes were held in the Museum of Fine Arts itself! 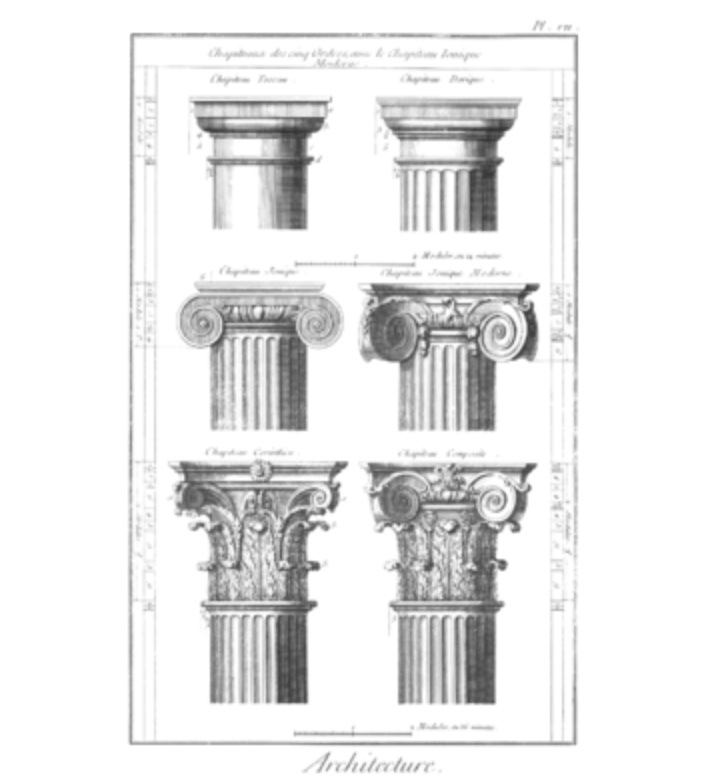 I remember learning many things, like the differences between the columns and capitols: Ionic, Doric and Corinthian, all which came from Ancient Greek architecture. A mini lesson for you! From top to bottom, Doric, Ionic and Corinthian styles. Moving along, I have been thinking about wallpapering or painting my dining room. 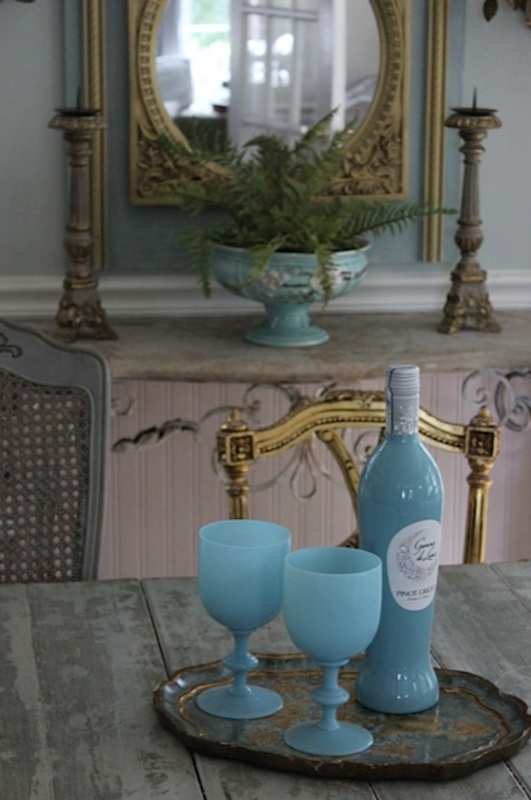 As I sit in the living room and look past my blue walls I can imagine a color or a pattern that pulls the robin egg color into the dining room. 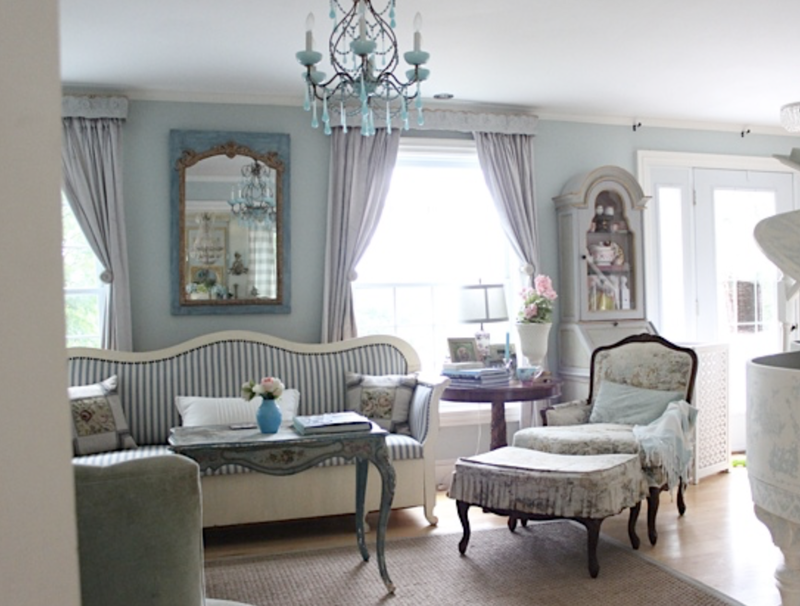 Or celadon green...as the living room has both blue and green. 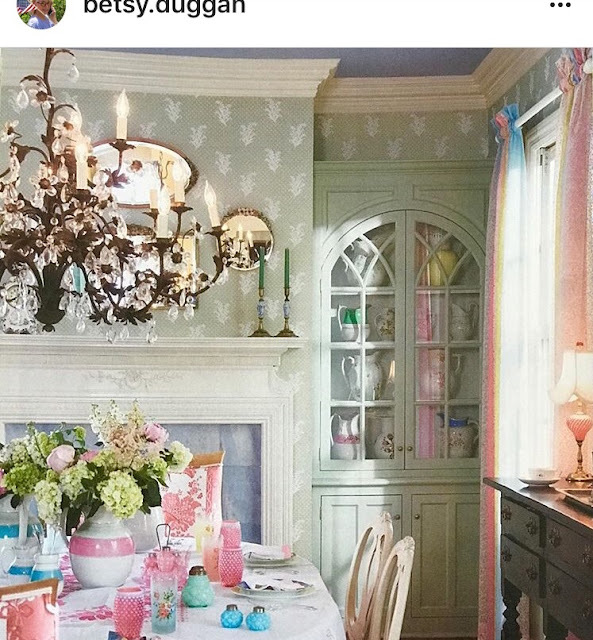 This paper by Laura Ashley is Summer Palace and has a background of robin egg. 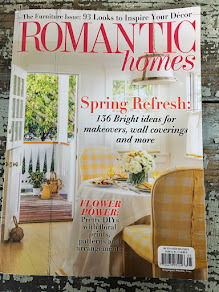 It also has pink and yellow which would look really pretty with the new opaline glasses I have from the Martha Stewart sale. But its not so hot with the purple transfer ware....and that is a dilemma. 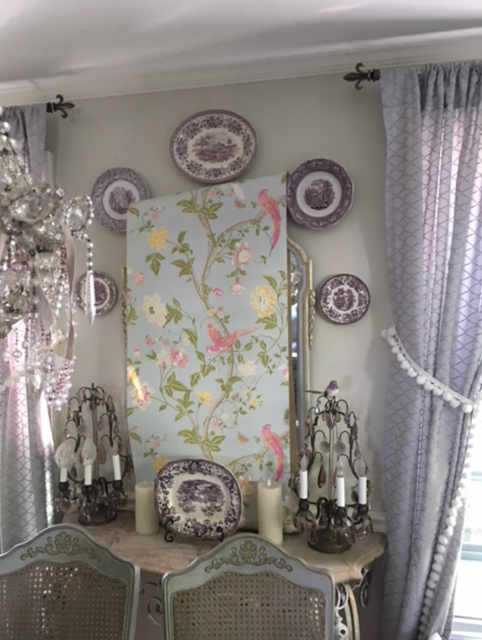 much decoration, and my dining room has a lot of decor packed into its four walls! 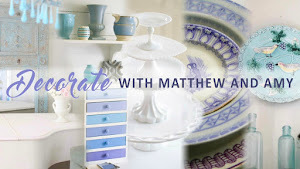 Always decorating in my mind, its a pursuit I am passionate about. 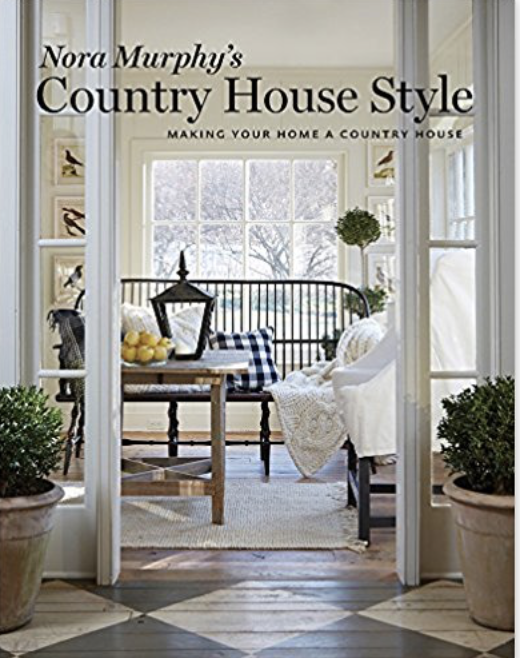 My home will never stay the same, it will always be tweaked and get facelifts or minor adjustments. did I change it? I know why, I just can't help myself! 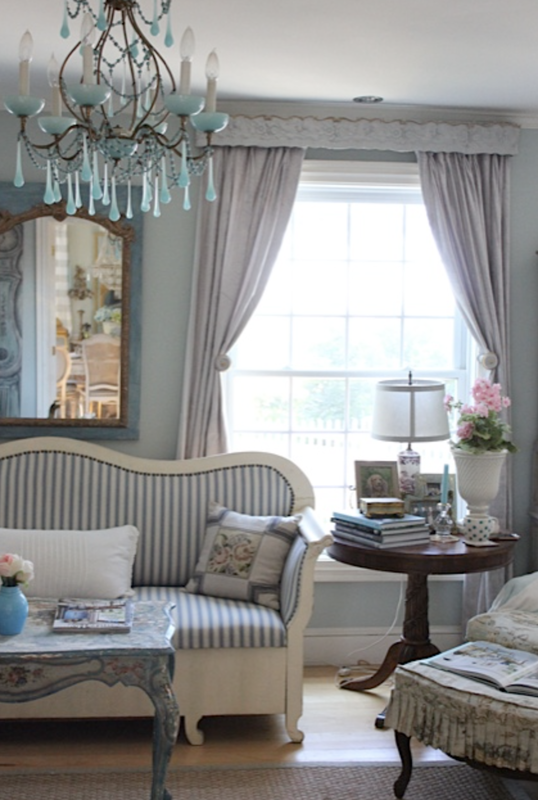 whimsical French cottage style. Maybe I just have to commit to one and swear off the other. Let me show you some examples from friends and designers. This is the dining room of my friend from Chicago, Betsy Duggan. 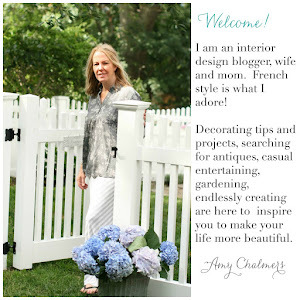 She is the one who sent me some blue opaline chandelier parts years ago when I began my opaline obsession, you may recall. Anyway, this is a dining room from her old house, and I thought it was so happy and welcoming. A good example of Happy French Cottage style. 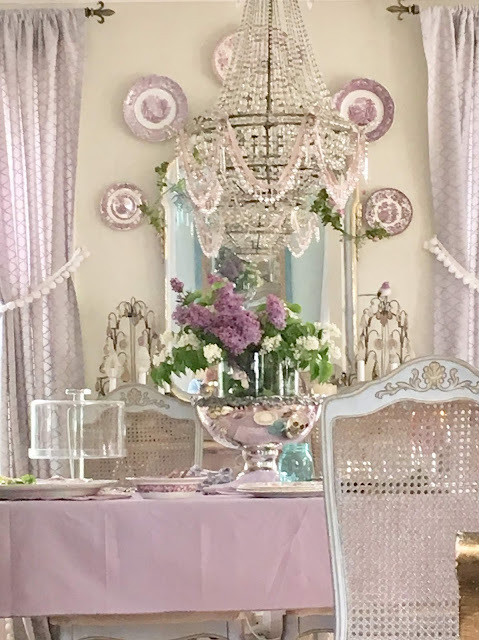 and table set with pinks and blues. Totally up my alley. 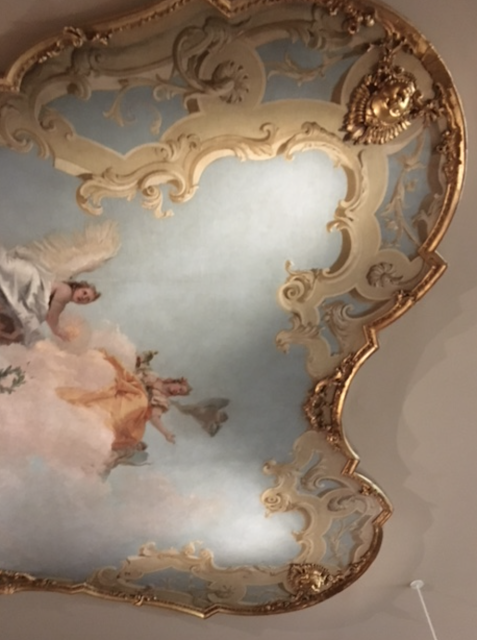 about them working with the Summer Palace wallpaper, can't you? 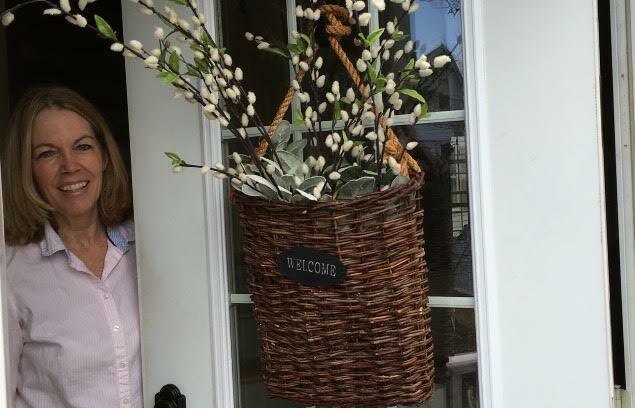 This designer, Leslie Biggley, from thelesliestyle.com, posted this photo recently. 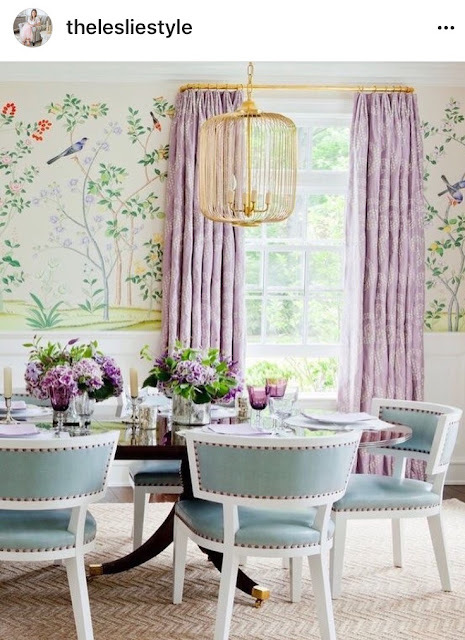 with the floral mural wallpaper. Its a tad too modern for me, but I love the overall look. Switching styles to the Rustic French Chateau look, this is a great example of what I LOVE. But in reality I don't have stone walls (yet) and so that is mostly what is so appealing in this space. 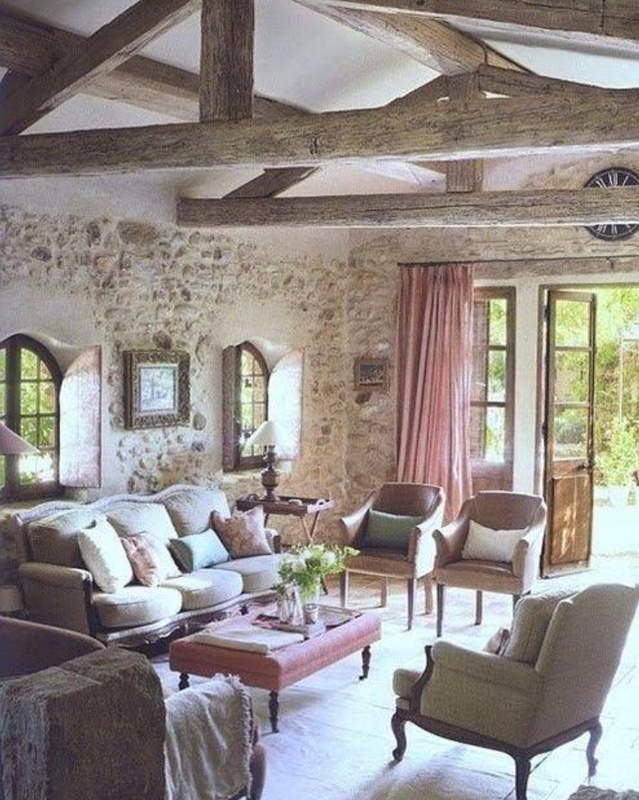 I loved the pink touches and the overall soft French look and of course the arched windows and the genuine French doors. 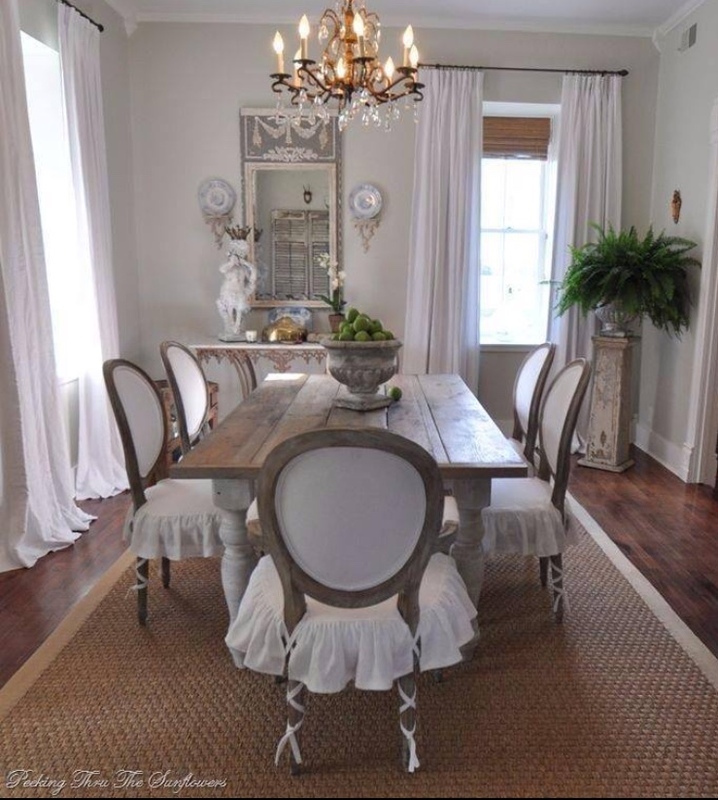 This is a paired down version of the rustic French chateau look that I find appealing. This image is from Peeking Thru the Sunflowers. I just wonder where all the stuff is kept? 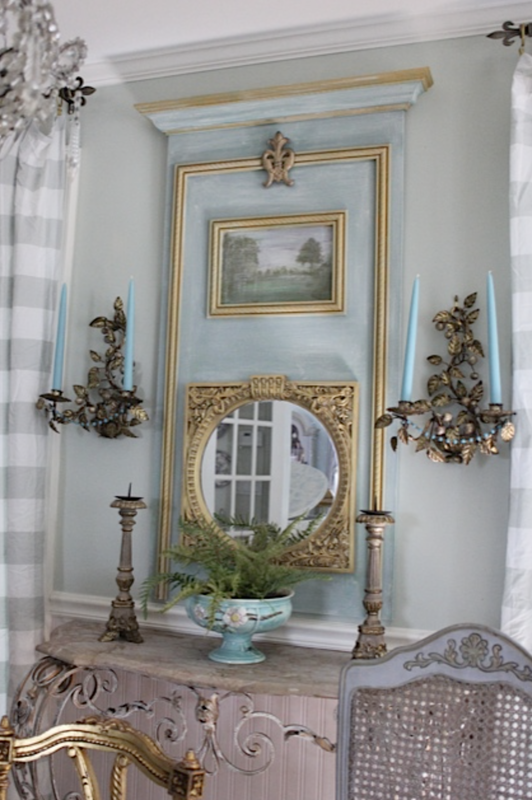 French console with the Trumeau mirror at the far end of the room. 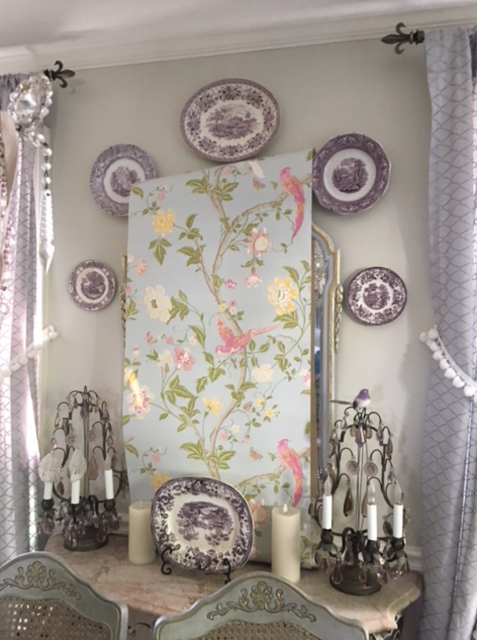 Hang up all my purple transfer ware plates and it essentially turns into my dining room! Right? 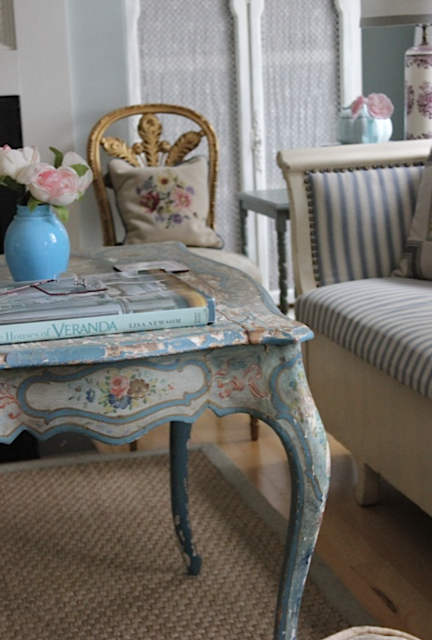 I have a rustic table under the purple cloth, and a French console too. Imagine sitting next to me on my couch....this is what I look at. for something to inspire me...and then changing things up. Two styles, two different approaches. Which way will I go? I don't even know yet.